Samford University’s Howard College of Arts and Sciences will dedicate a new statue of its namesake, 18th-century prison reformer John Howard, Feb. 13 at 10 a.m. in Brooks Hall. The public event, featuring historical notes, testimonials and sacred music, will begin in Brooks Auditorium and move to the building’s lobby for the unveiling of the life-size statue. “The dedication ceremony will be the culmination of years of effort,” said outgoing college dean David Chapman. “We are deeply indebted to many, including the Todd Crider family, who made generous donations to support this project. Howard’s privileged early life in 18th-century Bedfordshire, England, took a dramatic turn when he was elected sheriff for the county and took on responsibility for its prisoners. He found great injustice in the penal system, including generally poor treatment and prisoners who had been acquitted of all charges but couldn’t afford to pay their jailer to release them. Howard dedicated himself to prison reform in England and throughout Europe. He died in Ukraine in 1790, still on his mission. Howard was, and still is, widely revered as a model of Christian compassion for “the least of these.” Half a century after his death, a group of Alabama Baptists honored him in the naming of their new college. Howard College became Samford University in the 1960s, but Howard College of Arts and Sciences remains the university’s academic core. Howard College of Arts and Sciences has always honored its namesake through its commitment to world-changing education and service, but the university has never had any physical memorial for Howard. 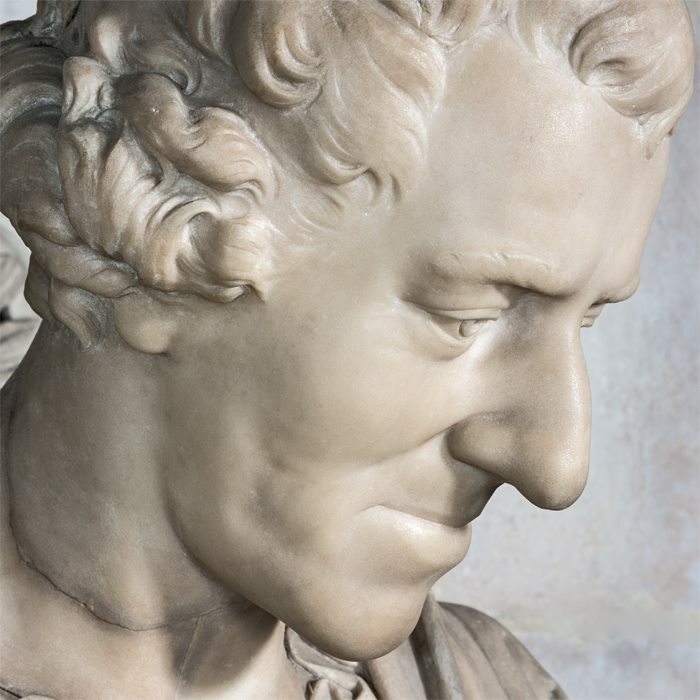 Dean Chapman, stepping down from the office this year, set out to change that by commissioning a copy of St. Paul’s Cathedral’s 1795 memorial by sculptor John Bacon, the finest of many depictions of Howard. The white marble sculpture, in a place of honor near the cathedral’s pulpit, reflects the classical influences of the Enlightenment, depicting Howard in ancient attire. He holds a book and key, and stands on opened shackles. A frieze on the figure’s plinth depicts Howard in a classical scene of compassion for a suffering prisoner. Chapman and college staff worked with cathedral staff, Edinburgh-based photographer Antonia Reeve and the Ancient Sculpture Gallery company to create the copy of the historically important sculpture. It is the first such project in the cathedral’s history.